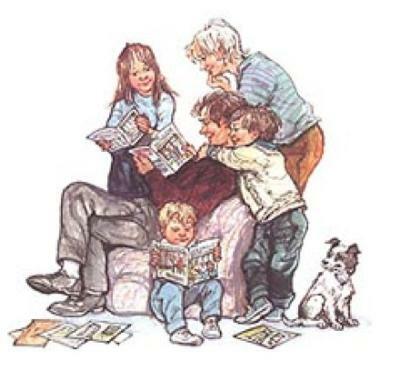 The Readalouds were a family of eight. They had a problem, they loved to read together, out loud, in the same room, at the same time. It was so noisy, none of them could understand what they were reading. Even their dog, Story, barked the entire time because he couldn’t sleep with all the racket. This made them all sad and they never smiled. Story never smiled either. “Please, please be quiet, everyone,” Father cried. They all put down their books and looked at him. No one said a thing. Deborah rolled her eyes. Nobody said a thing. Mother tried not to laugh. Nobody said anything. Edmund snickered through his nose. Story stood on his hind legs, put his paws over his floppy ears, and made a dog-humming sound. Nobody said anything, but Bridget giggled quietly. No one said a single thing. Andrew scratched his head and frowned. No one spoke up. Francis was embarrassed and turned red. Not one person said anything. Clifford put his finger up to his mouth and went Shhhh. “What a great idea, Andrew,” Father said. Everyone clapped and cheered, and Story barked happily. The family waited while Andrew custom-made lip zippers for everyone. The family began practicing until they could read with their mouths closed. The Readaloud family could now happily read together, in the same room, at the same time, with big smiles on their zipped lips. But best of all, Story didn’t bark anymore because he took turns sleeping at the feet of each member of the Readaloud family. I really liked this story. It held my interest until the en. It was quite clever how everyone had a silly solution and the zipped lips won.